Intrepid archeologist Jack (starring Jackie Chan) and ambitious scientist William (starring Tony Leung Ka Fai) set out on an adventure that would lead them to the greatest discovery in Chinese history. Their journey starts at Desar, India, where they stumble upon an ancient sword from the Qin dynasty and a magical gemstone that appears to be able to defy the force of gravity. The booty not only leads them to the mythical mausoleum, but it also connects Jack to his dark past life. Written and directed by Stanley Tong (Police Story 3 and 4, Rumble in the Bronx), The Myth tells the tale of archeologist Jack (Jackie Chan), who suffers from recurring dreams of ancient China. As the story plays out Jack’s dreams of what may possibly be his past life are inter-cut with his modern day Indiana Jones adventure. The problem with The Myth is that neither story reaches a sustainable momentum until the film’s climax, and the majority of the action sequences are pretty old hat. But don’t get me wrong, there are some key sequences that make this films worth watching, including a tar-paper-strip-converor-fight with Jackie Chan and pop star Malika Sherawat fighting side by side, and one battle scene in ancient China where Jackie stands godlike atop a mountain of bodies. And then, of course, there’s the film’s finale which I won’t spoil for you. The story's back-and-forth, grows tiresome, as one story strand is often cut short to catch-up with the other, and Tong seems unable to make the past flow emotionally or cinematically into the present. 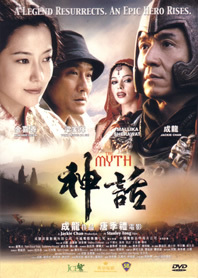 The Myth is quite an unbalanced film, but its metaphysical meditations, trademark Chan action, and tomb raiding storyline do keep you interested for the most part. It’s definitely not one of Chan’s best films, but at least it’s not one of his worse. Almost bare bone, the DVD contains a single making of feature which consists of a sprinkle of interviews, filming process and an MTV of the title song of the movie. In Dolby Digital 5.1 most certainly enhanced the experience during the fight scenes to its detail. Good news as there’s a choice of either in Chinese or Cantonese version. Pretty much like the rest of HK releases, the picture isn’t perfect but details are taken care of and it looks good. Bright and clear, the compression was not noticeable even during dark and fast action sequence.